The citizens of Belgrade witnessed an unusual “protest” today in the city centre. Neglected fruits and vegetables – the ones that are not so fresh or perfectly shaped, but still usable, expressed their revolt at being treated as waste. As they say, even though they might not look like their younger colleagues, they still deserve to be a part of our everyday lives and healthy diet, because they still have all the vitamins and healthy ingredients. According to them, the key to keeping a fresh, young look is being properly stored and kept in a refrigerator. “We have decided to protest against the fact that people throw us away due to inadequate storing. We may not be so fresh or perfectly shaped, but we are still tasty and healthy! We don’t want to be treated as waste just because we look different!” – said the apple, one of the protestors. 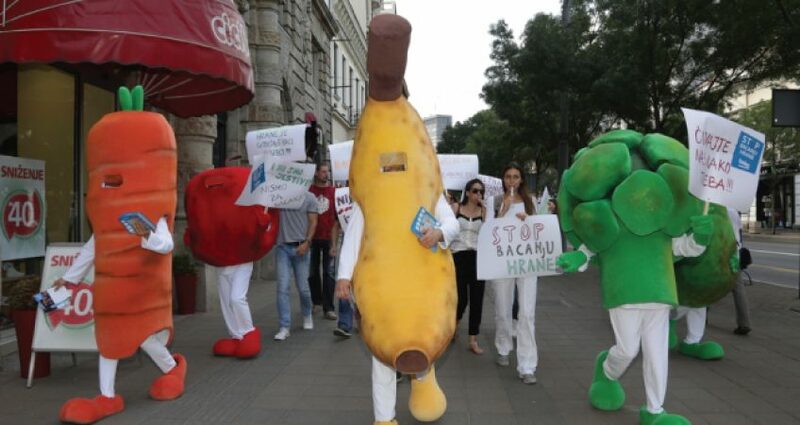 The protest walk is part of the “Stop Wasting Food” campaign, initiator of which is the Beko brand with the aim of drawing attention in an informal way to a serious topic – waste of food. As a socially responsible brand, Beko gives much importance to developing technologies that contribute to the preservation of resources, so for example the EverFresh+ technology extends the freshness of fruits and vegetables by 30 days. Fruits and vegetables were joined by the children from the “Majski cvet” kindergarten, who had an opportunity to learn more about nutritional values, proper storing of fruits and vegetables, as well as why it is important to use them in our everyday diet. The latest data shows that more than 250,000 tons of edible food is wasted each year in Serbia, while 628,000 people live in poverty. In order to help its community in resolving this issue, Beko launched this campaign with the aim of raising awareness and educating the public on proper storing of food, so it would stay fresh longer and be wasted less.